If you are looking for a sports wheelchair, or for a wheelchair which aids an active lifestyle, we have a range of products for you. Different sports and activities mean that your sports wheelchair will need to be either modified or specifically purpose-built. Here at Millercare, we aim to provide a range of sports wheelchairs to suit the needs of all our active customers, whether you need your chair for speed or ease of access. We also offer wheelchairs which allow for movement in the upper body, which is great for disabled basketball players, or players in similar sports, who need to be flexible in their chair in order to perform. If you are unsure of which product suits your specific needs. Why not visit us in store at your local branch, or click on specific wheelchairs throughout the site to see product specifications. All of our sports wheelchairs at Millercare are sturdy, with the majority being made from Modern Carbotecture, which allows for a strong frame We also have a range of colours and styles, depending on your specific needs or requirements. Some basketball players, or players in other sports, require a chair with a low back in order to be more flexible on the court or field. 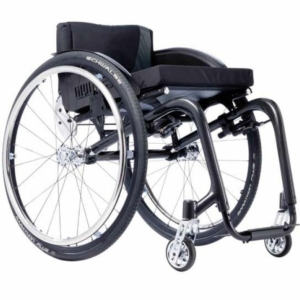 We have a range of sports wheelchairs with low backs, as well as mid height backs for ease of access. If you are after a chair with a high back for comfort, we offer a range of these to suit your everyday needs. For example, the Handicare Ibis Pro chair. With an award winning seating system and a wide range of support, the Handicare is great for providing comfort and practically. Other chairs in the Handicare range also offer velcro adjustments as to allow the user to move from a sitting position to that of a more comfortable one when the chair is not needed for sports or activities. The Helium sports wheelchair offers a wide range of 32 colours and has the latest technology built with activities in mind. The frame is strong and made from lightweight materials, making it super lightweight and portable - great for weekends away, or for when you're travelling to a sports event. With this chair, you can express your individuality, as well as have ultimate flexibility where you need it. If you don't know which sports wheelchair above suits your needs, why not browse through and click on the chairs that interest you? Once you click through you will be able to see more pictures of the product, as well more information on the specifications. 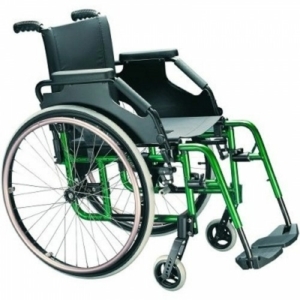 If you are still unsure as to what wheelchair you need, why not visit us in store. A member of staff will be able to discuss your specifications and find the perfect sports wheelchair for your needs.